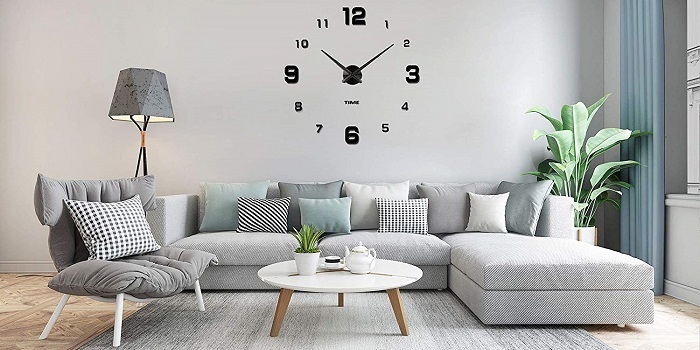 Besides as time keeper, the addition of a wall clock will beautify your office or home, and will make a modern or classical design of your room feel more complete. 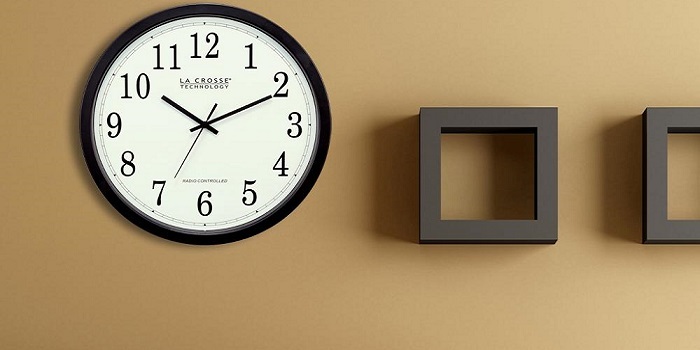 So if you like to enjoy the benefits mentioned above, and looking for the best wall clock, the list below will simplify your search. 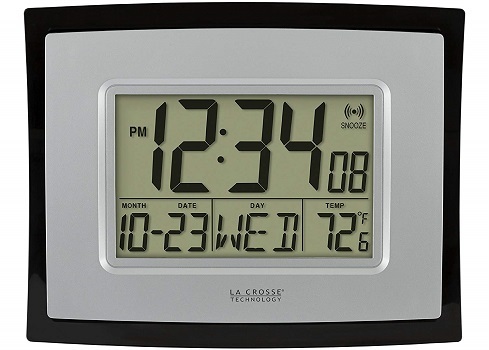 La Crosse WT-8002U show more than just time but also displays date and indoor temperature (Fahrenheit or Celsius). 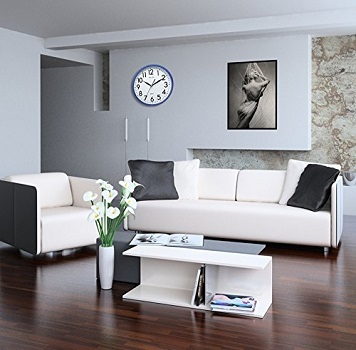 Its modern design will be an appropriate addition in your home or office. You can hang it on a wall with its keyhole bracket or stand on your office desk with its kick-out leg stand. To protect your investment it comes with 1-year warranty. • Easy to set and read. • Controls are conveniently located for easy use. • LCD screen isn`t backlit. 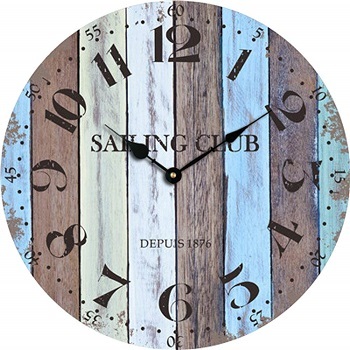 Grazing Blue Ocean comes as a retro-styled analog wall clock that adds charm to any room in your home. 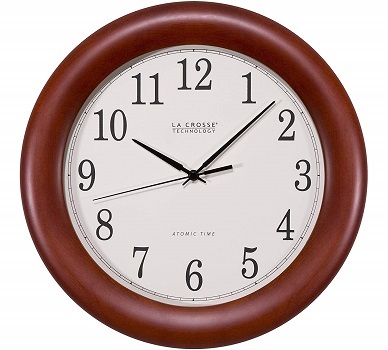 La Crosse Technology WT-3122A brings a white dial and a wide, solid wood surround with a beautiful walnut finish dresses up any home, office, or classroom. 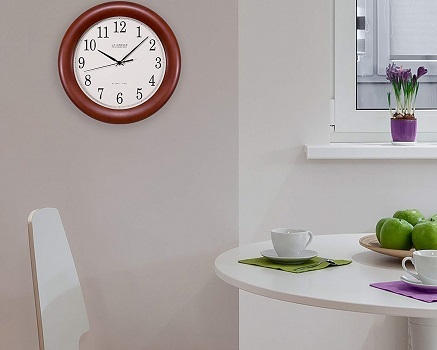 This wall clock set itself automatically to exact time accurate to the second and the manual override setting lets you set the date and time yourself for areas where Daylight Savings Time doesn't apply. • A good accent for any wall. • Doesn't make any noticeable noise. • The numbers are nice and large and easy to see. • No ability to turn the auto-sync off. • Not ideal for people outside the US. 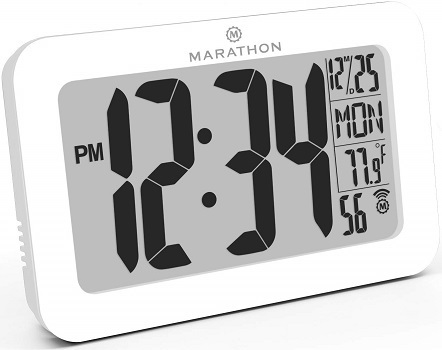 Marathon CL030033WH offers self or manual time setting and display indoor room temperature in Celsius or Fahrenheit. 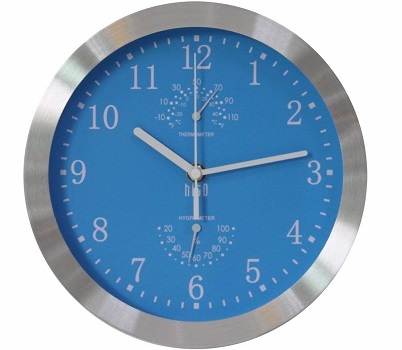 Its sleek, contemporary design features a brushed steel effect frame and large numbers making this beautiful clock ideal for home, office, school, hospital, etc. It easily hangs on a wall or can be placed on a table top using the sturdy fold-out stand. • Clean, uncomplicated design with large display. 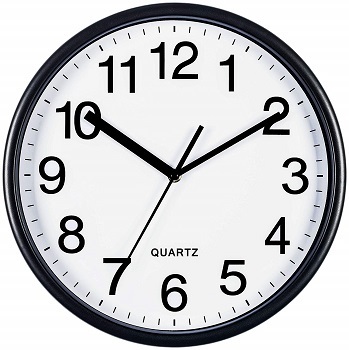 • The viewing cone is only about 15 degrees - you have to look straight at the face of the clock to read time. 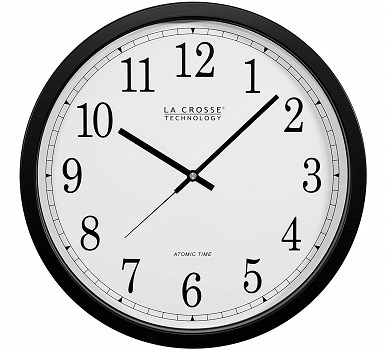 La Crosse Technology WT-3143A-INT automatically sets to the exact time and provide four-time zone setting and automatically updates for daylight savings time with an On and Off option. 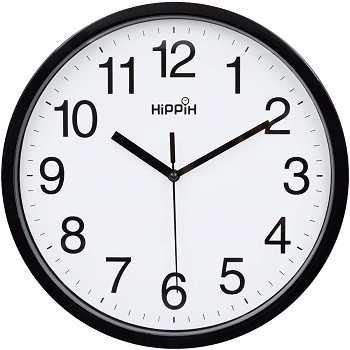 This round wall clock is numbered and has Arabic numerals in a bold black finish for better visibility. Simple straightforward design with classic black and white color brings a classy vibe to the whole room and make walls of any shade look stylish. • Extremely easy to read. • Accurate to the second. • You may experience signal disturbances. 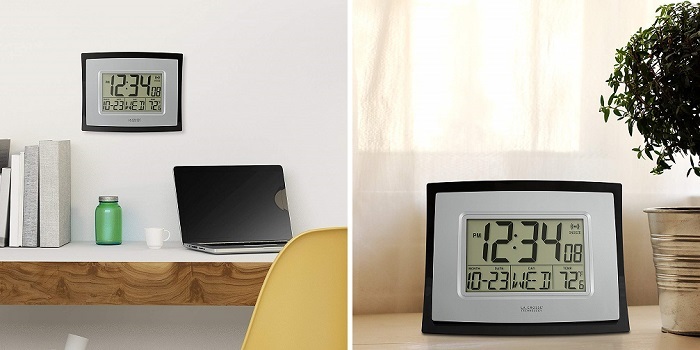 Bernhard Products 04016 display time accurately without disturbing ticking noise and classic frame to dress up your room’s decor. • A bit difficult to put in the battery because the battery compartment is too small for a "AA" battery. Hippih brings simple design suitable for any room decoration while its large point and clear lens guarantee a good view, even from the side. 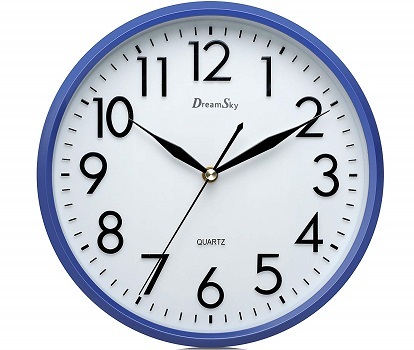 DreamSky brings modern and sleek design with quartz movement helps you keep track of your day accurately. • Easy to read the time. • No battery cover to pry off or slide out of the way. 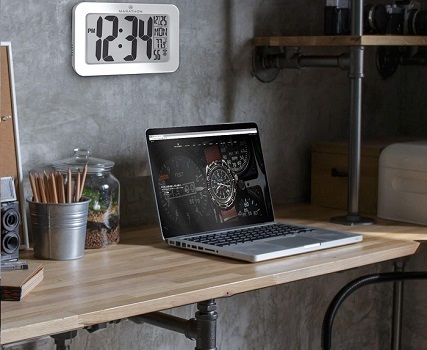 hito display time, temperature, and humidity accurately while its contemporary and modern design is a piece of wall art. • No sound at all. • Easy to read the time, temperature, and humidity. • The bolt holding the arms may rust. 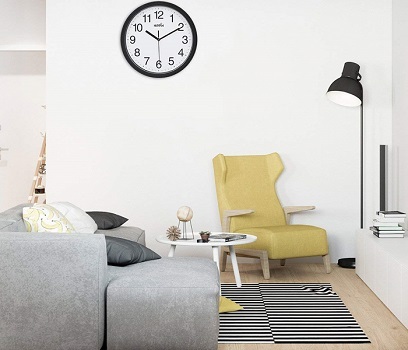 • Large white numbers and hands, while white clocks come with huge black numbers and hands. • Battery operated by one AA battery (not included) - can last about 1 year. 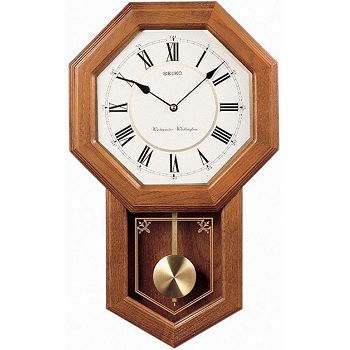 Seiko QXH110BLH a beautiful classy-looking wall clock that displays time accurately with its quartz movement. • Built from solid wood. • Chime sounds very nice but is not fantastically "rich". • The pendulum is cosmetic only - unrelated to the clock's timekeeping.